"Enthralling literary overseas adventure, filled with tension and humor, thrills and laughs. Fascinating and unique!" The Columbia Review. “The Steel Barons” by Alex Frishberg is a suspenseful novel featuring a young American lawyer who, as an expat in Kiev shortly after the fall of the Iron Curtain, finds himself involved with a colorful cast of non-law-abiding citizens. “The Steel Barons” opens a literal window into a world that’s little known to Americans and western readers. The stage set is gritty, the plot is realistic, and the story is original and lifelike. Think “The Firm” set in Kiev, and you get the idea! Mr. Frishberg, the author of several other works (and himself an Ukrainian-born American lawyer with extensive legal practical experience in both countries), succeeded in delivering an entertaining, fast-paced, and highly enjoyable novel. The dialogue fires with human authenticity, the Soviet-era sins (that come to haunt the sinners) are utterly fascinating, the brazen human corruption (as contrasted with human kindness and love) is mesmerizing, and the tone and tenor are genuine and engaging. 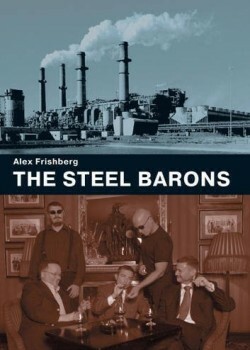 In summary, “The Steel Barons” by Alex Frishberg takes the readers on an enthralling literary overseas adventure, filled with tension and humor, thrills and laughs. This book is certain to remain memorable. Fascinating and unique!